In the short time Maxwell Rushton has been in the professional art world he’s caused a stir throughout the international scene, doing solo exhibitions throughout Europe and the UK. 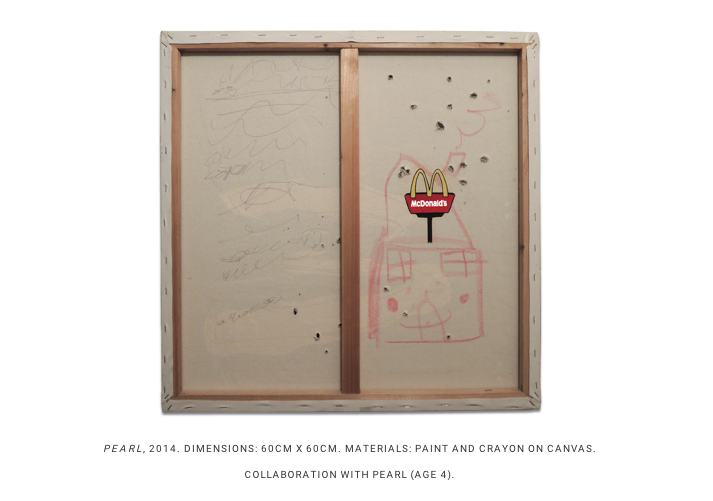 He’s become well known for employing many different mediums and exploring a wide range of themes concerning culture and consumption, from globalisation and branding, to the far flung opposite, psychological struggle and homelessness. However Maxwell’s work is a two sided coin, in addition to being politically enthused and featuring sensitive themes he utilises some dramatic and extreme techniques and circumstances to enhance his creativity, impact and thoughtfulness. Maxwell has taken the concept of putting yourself into your art quite seriously, and quite literally.The significance of blood cannot be overstated, Rushton has decanted his own blood, and actually used his body as painting material in his artwork, turning himself into a logo. Peter Beard was ground breaking in using animal blood to paint over images of animals he photographed, but Rushton has literally transformed himself into a logo. 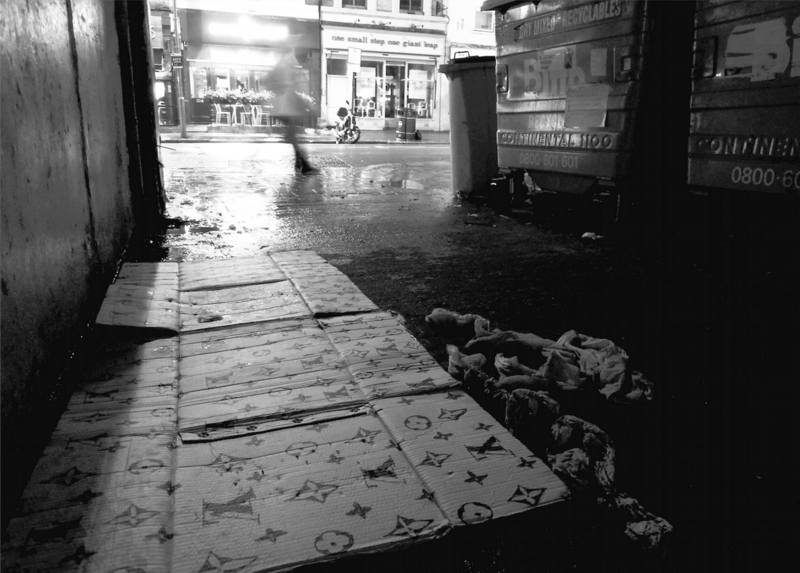 You've explored such contrasting subjects from homelessness to advertising, do these feel like very separate issues for you, or is the relationship between consumerism and homelessness in fact the same? The relationship between these seemingly separate cultural issues is actually quite fierce. Consumerism is the strangulation of identity, where marketing manipulates the priorities of the individual by promising that happiness is found through material ownership, as opposed to the primal happiness we feel when we simply help each other. Do you feel that within the contemporary art market it’s possible for artists to escape becoming brands themselves? 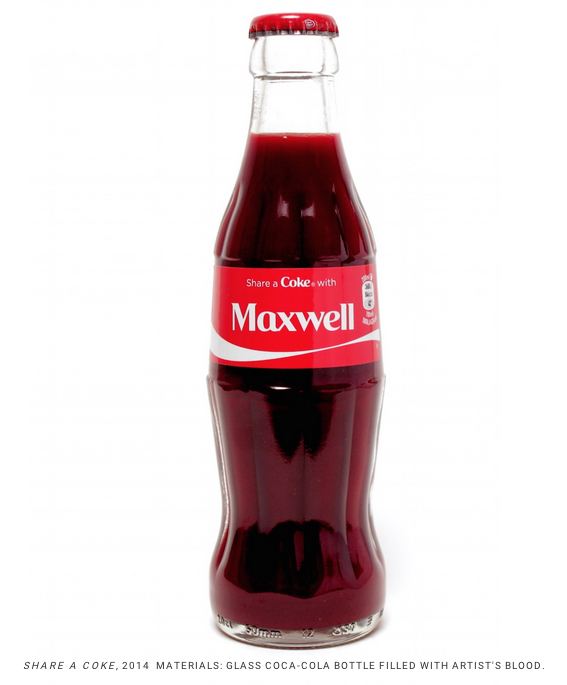 And was your piece ‘Share A Coke With Maxwell’ a comment on this? No I don’t think it is. The contemporary art market is a commercial market like any other, most of the human components in this industry tend to talk about the artists as they would a brand, and the artist’s work as products. This way the industry can sell art by the same means luxury items are sold to us; through their brands. 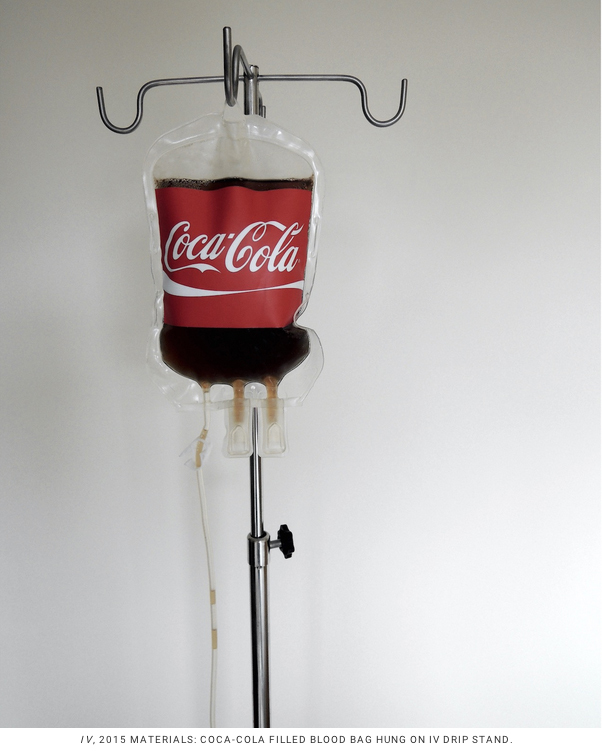 The ‘Share A Coke With Maxwell’ sculpture inspired by that phrase “be the brand” and is a attempt at consuming the coke brand (the world’s largest brand) as well as it’s product. I drank the coke from the custom made Share A Coke With Maxwell glass bottle that I had customised, and refilled it with the same quantity of MY blood. I guess because the work is an exchanging of fluids I now look this piece as a satirical kiss. Are there any artists that were influential in you developing your fascination with man and the brand? In a round about way yes, but it started with a love for Outsider Art, not that I was interested in specific Outsider Artists, just the idea of the self taught artists was really attractive to me. I wanted to emulate their work but after trying for some years I realised I was never going to have the same uninfluenced authenticity. I started experimenting with the opposite of Outsider Art, which I think of as ‘synthetic art’. I started experimenting with a language inspired by commercial culture. Because a lot of my practice is like mutated Pop Art I don’t tend to look to other artists to develop it. You seem to be interested with transcendence through ritual and art, do you see art as a spiritual, ritualistic process for yourself? To make art I have to totally apply myself to what I’m doing, sometimes this means blurring the lines between art/artist and process/product. I describe some of my durational pieces as being self determined right of passages. Also yes, transcending the traditional notions of how we think of a person’s identity is a major part of the work I do with branding. Corporations sell products and people by putting them on divine alters, when I make work inspired by this behaviour I have to mirror this religious aspect, only then will my work be true to life. You seem to be a man of extremities, such as your creative time spending over a year drawing in isolation, and using by far the largest quantity of blood ever used in a piece of art. Does the challenge of doing something extreme fuel your motivation to create, and is there a relationship between the creative aspect and the mental and physical challenges involved in your pieces? Definitely. If I set out to explore themes that are extreme in nature, then the mental/physical process or the resulting physicality has to be equivalent to this nature so that the expression makes sense. I don’t do what I do because of the challenge, my passion starts and ends with the love of thoroughly exploring subjects which interests me. Are you fascinated with branding and society, is this in love or in loathe of our slavish culture towards branding and consumerism ? I used to answer my own questions in my older work, now my aim is be objective, I never pinch my nose at consumerism, I have a logo for example and think of my art as products which I manufacture. How do you explain this Logo that you’ve recreated so many times, even printing in your own blood, in relation to your stance on consumerism and branding? The logo is derived from a set of four vertical lines I kept drawing when I was a child. When I got older I realised that this motif of marks wasn’t trivial, they were the only bit of art I was ever going to make that was without any external influence, they were innocent. Turning them into a logo represents how we are reshaped by commercial culture. 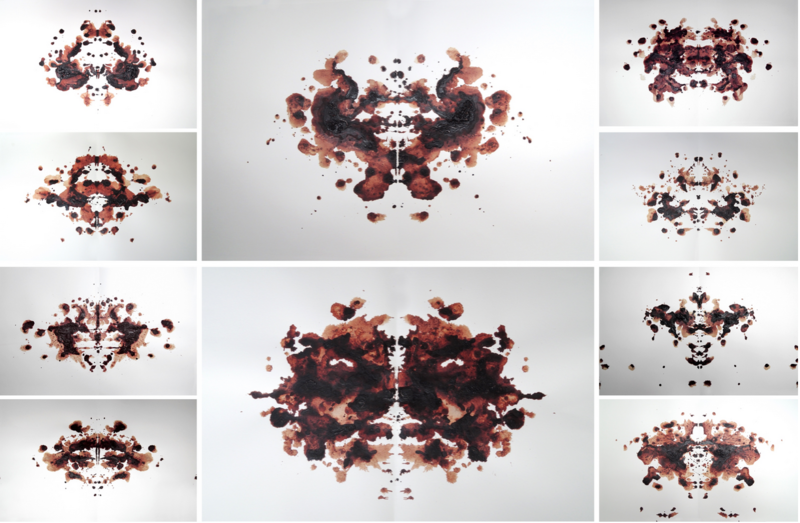 Your piece ‘Buy In Bleed Out’ (2011-2015) used the most blood ever used in a piece of art, and stands 2x3m. 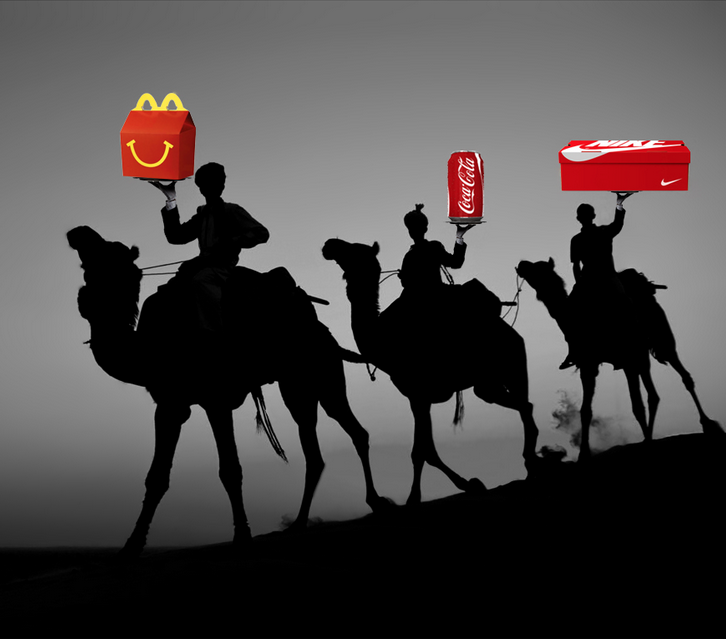 You say its inspired by the relationship between brands and religion. What sparked this interest and what triggered you to decide to follow such an extreme concept as a piece of art? I wanted to take commercial culture to an extreme. I wanted to consume consumer culture before it consumed me. I saw that an individual, such as myself, would role-play that they are living the lifestyle depicted by a product’s brand. Being part of another brand is unsatisfying so I wanted to create my own so I could be a competitor and not a victim to commercial culture. By turning twenty pints (twice the amount of blood in my body) into a logo I was blurring the gap between myself as a human being and as a brand. I used my blood in this work because blood has held connotations of worship for millennia. The painting is an adaptation of a ancient sacrifice and a process of transcendence. The whole thing is about how society worships brands because they are unfulfilled by the products. 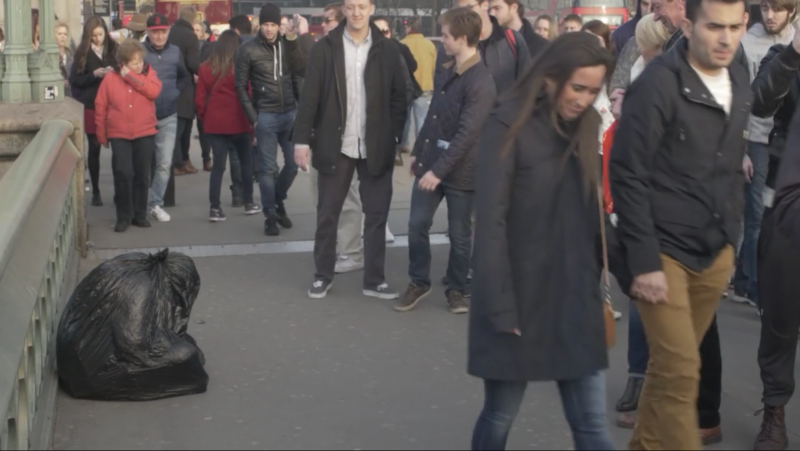 WHAT WOULD YOU DO IF YOU SAW A FIGURE WRAPPED IN A REFUSE SACK, HUNCHED OVER IN THE STREET? LEFT OUT EXPLORES WHAT HAPPENS WHEN THE PUBLIC IS FACED WITH AN UNEXPECTED EXPERIENCE ON THE STREETS OF LONDON; WHILST EXAMINING THE THOUGHT PROCESS BEHIND THE ARTWORK. IN FOUR DAYS A VIDEO OF LEFT OUT RECEIVED MORE THAN 10M VIEWS AND 130K SHARES. THE LARGEST AUDIENCE HAS COME FROM LATIN AMERICA WHERE THE RESPONCES HAVE BEEN PASSIONATE AND POSITVE, BUT THE VIDEO HAD PROMPTED EMOTIVE AND HEART FELT RESPONCES FROM ACCRESS THE WORLD. In stark contrast to the busy metropolis and art market that is London, where you now reside, what made you feel the need to live in isolation for over a year? And how did this effect your artwork? I wanted to escape every influence I could to make a piece of art that would act as an equal/opposite to ‘Buy In Bleed Out’. Instead of experimenting with commercialism which is what I had been doing, I wanted to gain perspective so I could understand our culture more. Even though I felt familiar with commercial culture I knew I didn’t understand it fully because I didn’t understand myself. It was an internal investigation that would inform my understanding of the external world, so I moved away and drew those same four marks I was making when I was a child over and over again. Because I ended up drawing approximately 10 million marks whilst living in isolation, this project was both therapeutic but very mentally/physically challenging. On completion my hand was a mess and my mind was playing tricks on me, but the experience of finishing a project like that is indescribable. Can you tell us anything about your upcoming exhibition ‘IN & OUT’, curated by Kosha Hussain, in London 2016 ? We're super exited about it because I'm going to be exhibiting 'Buy In Bleed Out' and some other pieces, but still a fair amount of decisions that need to be made before we can start talking about it. It will be your invitation will be in the post!